I was hoping Santa was going to deliver the Audax Australia Checkpoint Magazine today, but he chose to surprise me instead . Thank you Mark, and perhaps Santa is from quite as far north as the North Pole, as previously believed? Mark, was riding on Audax Australia’s Sydney Melbourne 1200k where I had a bit of a spill after a collision with a wombat (more on this blog soon, or see the Summer Issue of Checkpoint Magazine). Aside from five fractured ribs and a separated AC Joint on my shoulder, I did destroy some clothing and left a few scratches on my cycle. As I’ve previously noted, finding genuinely reflective isn’t the easiest of tasks, so it was wonderful to receive this surprise in the mail. 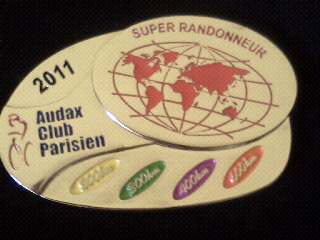 It serves an example of the camaraderie between Randonneurs around the world. I followed along in the support vehicle as Gerry Eddlemon set about creating a UMCA record* for crossing the North Island. With no established UMCA records in New Zealand, Gerry selected a end points of Raglan and Te Araroa to set a course that travelled due west between each side of the North Island. Riding in the support vehicle were crew chief Ron Skelton, Tim Neal, Di Chesmar, myself and UMCA officials Christine Couldrey and Tracy Parke. Add-in Gerry's ten laps of Taupo (1 x Extreme Enduro; 1 x Enduro) and there were 107 laps of the Contact Lake Taupo Cycle Challenge crossing the North Island! Long distance cycling is going from strength to strength in New Zealand. Now that there are some records set*, let's see if we can all encourage greater participation in the sport. * These records are pending ratification by the Ultra-Marathon Cycling Association. Gerry also created a record* across the South Island recently. It is June. This means only one thing. It’s RAAM time baby! This is an epic race, with no stages, no domestiques with no contrived team tactics, nor team pharmacists. The strongest legs will win plain and simple. Some come to win, others come to finish this 3000 mile race, which is the pinnacle for an Ultra-Cyclist just as Everest is to mountaineer, the Olympics to a many athletes or a World Cup is to a rugby or a football player. In the New Zealand corner for this years race is Art Schwencke (Team Riha) whom I met at the Lake Taupo Extreme Enduro in 2011. Like past years, I’ll be following the Race Across America very closely online, with a particular emphasis on following how our Kiwis are doing in the event. Bon Courage Art! I’ll endeavour to keep my spreadsheet of Kiwi efforts in the RAAM up to date as the race unfolds. The official race coverage can be found at http://www.ridefarther.com (Microsoft Silverlight is required to view the live tracking). I've tried to embed the key bits of my spreadsheets below, so they will display on more devices. If you have an overlap issue due to site styling, click here. A very brief moment of Strava Glory! Strava is a GPS based training motivation tool. They reguarly have challenges, to ride at least a certain amount of time, or as far as possible within a certain timeframe. As a Randonneur, naturally the distance based challenges are well suited to me and during the “January Base Mile Blast”, while not at the top of the overall leaderboard, I successfully logged the longest ride. Not because I tried to, but because I needed a 600km brevet completed for qualifying for The Big Wild Ride 1200k in July. It was nice to receive some goodies earn a small reward, after opening the Picton-Westort-Picton 600 with 300km of headwinds. I was impressed to get a handwritten note from a technology focussed company.